Every one of us wants to have shiny hair and a glowing skin. However, it is not possible to have the desired hair and skin at all the times. Almost all of us have to face some of the problems with the hair and the skin. We come across a number of diseases and conditions that affects our hair and skin. 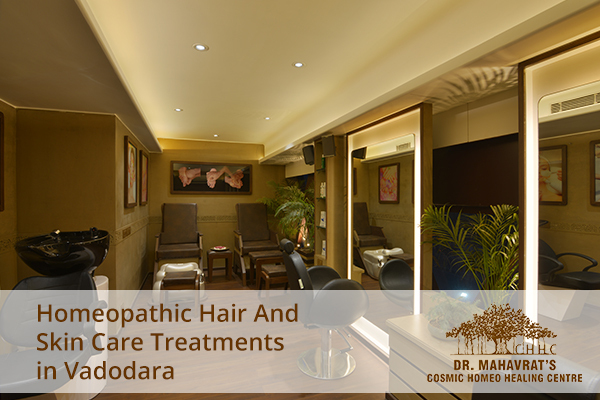 At this point in time, the affected individuals readily look forward to any of the top quality skin care treatment along with fantastic hair care treatments in Vadodara. This is the exact situation where Cosmo Homeo Healing Centre or CHHC comes to the rescue of the individuals. Skin and hair care are the most important concerns of the people in the recent times which is efficiently and effectively taken care by the CHHC at its best. The hair and beauty services so offered by the Cosmo Homeo Healing Centre are as discussed below. Acne is one of the most common complaints of the adolescents at the time when both the young boys and girls become very much concerned about their overall looks as well as their appearance. Acne is associated with the oil glands of the skin which is not dangerous but leaves unwanted scars. Our homeopathic treatment makes sure to treat the acne effectively. The treatment of homeopathy is simply undebatable and time-tested which is aimed at treating the causative as well as precipitative factors. Most importantly, the homeopathic treatment can be continued over a prolonged period of time without any side effects. The medicines such as Allium sativa, Acid tannic, Granatum, and Natrum Phos take care of the acne on the skin as a result of the disturbed intestinal flora, constipation and accumulation of nitrogenous wastes. We use the medicines like Oophorinum, Pulsatilla and Cimicifuga for dealing with the alteration of the hormone level. Acid Nitric, Cocculus Indica, and Nux vomica are used by us for eliminating the harmful effects of night watching and stresses. We at CHHC use Bovista for the individuals with sensitive skin helping them to fight acne due to the excess use of cosmetics. Apart from these, we use a number of other homeopathic medicines to treat the acne problems which depends on the type of skin of the affected individuals and their conditions. Hair loss is another of the very common problems that almost everybody has to deal with on a regular basis. But homeopathy has the ideal solution for this. Hair loss or thinning of hair can affect in the self-confidence in people who are suffering from it. At CHHC, we have a large range of medications that help in dealing with hair loss so that it can be brought back to its original condition. Our treatment procedure is designed as follows. Carbo veg and Thallium are immensely beneficial for helping to deal with hair loss after any deliberating disease. Mezereum and Sanicula are best in treating the underlying complications such as dermatitis and dandruff. The hereditary connection of hair falls and restoring the body balance is done by deep acting and intercurrent medicines which we use. For alopecia areata and other conditions, we use some of the effective and specific homeopathic medicines. We always use such homeopathy medicines which are able tostop the recurrence of hair loss and provide a permanent solution to the problem. Skin pigmentation is another problem for which the Cosmo Homeo Healing Centre has an effective solution. We believe that a well indicated and a well-prescribed homeopathic takes a very good care of hyperpigmentation as well as treating the person as a whole. Homeopathy treatment by us for dealing with skin pigmentation is done in the following ways. The medicines used by us effectively treat the hormonal imbalance which plays a vital role in tackling the excess production of melanin that helps in the improvement in texture of the skin along with the prevention of appearance of new patches. Sepia is used by us for dealing with various types of pigmentation. We also use some of the highly indicated miasmatic medicines that help in the reduction of excess melanin production and removes the tendency of hypersensitivity to sunlight. Sepia also helps to treat discoloration of the skin usually occurring after pregnancy. Caulophyllum and Iodium are homeopathic medicines that we prescribe for a flawless skin. Our homeopathic medicines help in fighting skin pigmentation that arises due to the side effects of other drugs or therapies. We aim to remove the underlying problem so that a complete cure can be brought about. Homeopathic treatment does not believe in the use of ointments and creams for the treatment of skin problems. It believes that the skin problems are a reflection inside and therefore needs to be treated from inside.